For the love of life: World Card Making Day!!! Welcome to my blog on World Card Making day!!! Today is my favorite day!!!! Since I love to make cards, I am celebrating World Card Making Day. There are so many activities today all over, but I want to highlight a few that I plan on playing along with. 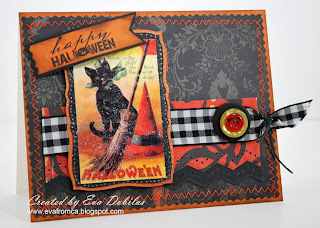 Treasured Scrapbooking, Caardvarks and Splitcoaststampers! Make sure you check them out! My first card is for Treasured Scrapbooking, where all the designers are having their own card challenges, so please come and check out our forum set up just for this special occasion. The first prize winner will win a Card kit!!!! How fun is that? You know how much I love the kits Leslie puts together! 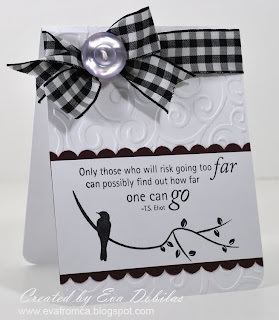 My challenge is to create a shaped card. 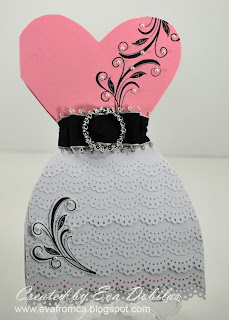 Since the month of October is Breast Cancer awareness month, I have been creating with the colors pink, white and black my past few cards and I decided to make a lady's dress shape with those colors again. Well, here is my card. So, what do you think???? 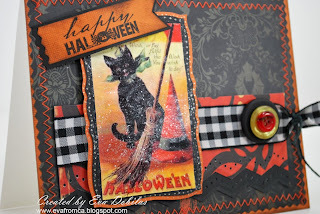 My last card to share with you is a Halloween Card. I made this using a cute Halloween image I bought forever ago from www.alteredpages.com. So here it is. And here is a close up of the image. The reason I am showing that to you, as I added a layer of Rock Candy Stickles by following Tim Holtz' tutorial. I like the way it turned out, so I will use it again. Click on the picture to enlarge it, if you really would like to see the affect of it. 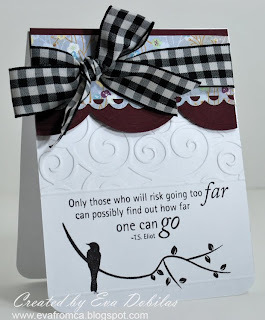 I also came up with a fun technique while I was making this card, but I will share about that another day. Well, hope these cards inspire you some and that you will have a fabulous card making day, in fact a whole weekend. I plan on playing a lot today and tomorrow in my scrap room.